Not very many people have used biometric locks during their lifetime, but most understand the basics of a biometric lock. I believe the credit for this should go to some Hollywood blockbuster or spy movie. A fingerprint door lock is a specific type of biometric door lock, and it is the most commonly used biometric door lock. There are several key benefits to utilizing a fingerprint door lock, chief among these is security. The list below will look at some of the best fingerprint door locks on the market today, and the ways in which they enhance your security. 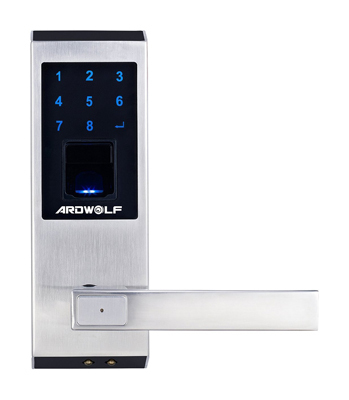 Homeowners that want to take advantage of biometric technology in their homes will be relatively satisfied with what the Ardwolf A20 fingerprint door lock has to offer. The A20 is a battery powered fingerprint door lock that comes equipped with deadlocking latch bolts that are meant to reduce the likelihood of anyone shimming or jimmying your fingerprint door lock. While the aforementioned processes might be great at getting you back into a locked car, they will not be successful against the Ardwolf A20 fingerprint door lock.This fingerprint door lock also gives homeowners and commercial business owners a plethora of ways to access their lock. The lock can be operated by using fingerprints, pin codes, mechanical keys, and the combined use of dual authentication. Dual authentication simply means using two of the above measures simultaneously as an enhanced security measure. Another benefit of this lock is its price range, which will allow many homeowners and small business owners to use biometric technology without breaking the bank or stretching their budgets thin. Ideal for exterior use due to waterproof features. 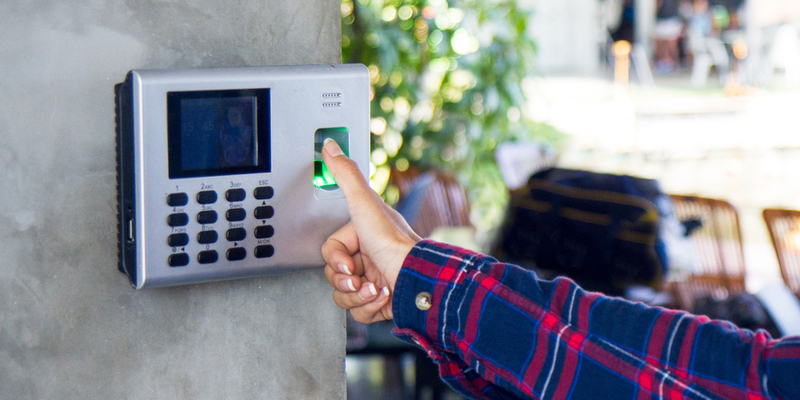 Multiple access methods make it ideal for multiple users and access control. Deadlocking latch bolt provides an extra layer of security. The Adel 3398 fingerprint door lock is very similar to the Ardwolf lock that was described above and carries out most of the same functions with ease. Also, the price of the door lock makes it much more desirable to homeowners that are merely trying to get their feet wet when it comes to biometric technology. Homeowners and small businesses alike can benefit from using the Adel fingerprint door lock. The lock makes use of 3 potential access methods. These are fingerprints, a password and the traditional use of a mechanical key. 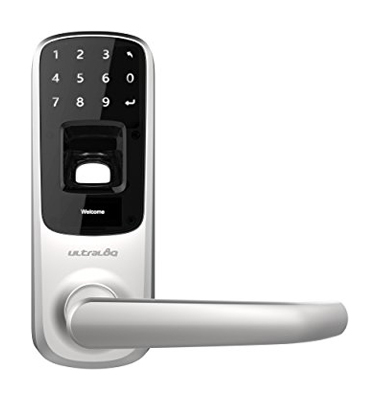 In terms of storage, the 3398 fingerprint door lock has the capability to hold up to 100 fingerprints, but is restricted to the use of only one password. This might sound limiting, but it is not that big of a deal. In the average household, most people will not utilise a lengthy password, because it will be easier to operate the lock with your fingerprints. The same concept applies to office spaces that might want to use the Adel 3398 keyless fingerprint door lock. Your office space can be kept more secure by having employees access locks through their fingerprints, rather than having a large group of people using the same passcode to operate the lock. The Adel 3398 is rather easy to install and requires no additional wiring to be set up. It is essentially a plug and play lock. Stores up to 100 user fingerprints and provides audit trails that help you monitor the way the lock is used. Similar to the last two locks we looked at, the Ultraloq UL3 is relatively cheap. The low price point is because the lock is geared towards residential and commercial spaces. Residential properties do not require the same access control solutions as most commercial properties, so the Ultraloq looks to find a balance. It is a rather admirable notion, but one that might see this lock being far less secure than its counterparts, which is why it is occupying this position. In a commercial setting, the U-tec Ultraloq is best suited for small business owners that want to use a fingerprint door lock on multiple interior doors. It is for this reason that this lock is on the list as one of the best fingerprint door locks that enhance security. The lock boasts an IP65 water and dustproof rating, as well as an advanced fingerprint reading system that can store up to 90 users. Also, the lock places the keyway at the bottom of the lock body, in a bid to make it harder for people to exploit. However, do not be fooled into thinking that this lock is the ultimate security option because of this feature. Advanced fingerprint verification decreases the risk of error when reading fingerprints. Easy DIY installation process helps reduce the cost to change locks. The UL3 is a weather resistant lock that can be used on exterior doors in residential settings. Efficient energy settings helps the lock’s batteries last longer, which decreases the chances of getting locked out of your home or office. The biometric fingerprint door lock that Yale brings to the table is, in many ways, reminiscent of what consumers have come to expect from the products that Yale and other prominent door lock brands have to offer. At first glance, one of the most striking things about the Yale lock is its sleek appearance, which (in terms of design) positions it miles ahead of some of the competition. Yale incorporates multiple access methods, even though it is touted as being a fingerprint door lock. This is not necessarily a bad thing, but there is always a chance that these other access methods could be exploited to make the lock more vulnerable, but I digress. The Yale YDM4109 fingerprint door lock features the one touch verification method which makes use of progressive scanning. Progressive scanning is a double edged sword that helps enhance your security while also increasing the ease of access that you have with your lock. The progressive scan feature captures your fingerprint in a more accurate fashion, which is something that other fingerprint door locks seem to lack. Also, this lock has several features that make it one of the best fingerprint door locks to enhance your commercial security. For instance, the lock features an anti-panic egress handle that improves access during emergency situations like school shootings, etc. This is an integral part of building safety and security even though it is often overlooked. 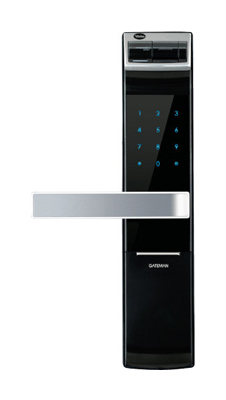 Furthermore, the lock is equipped with a high-security mortise cylinder that can be operated by up to 20 fingerprints. Additional, the YDM4109 mortise fingerprint door lock has an automatic alarm that is triggered during break-ins or as a result of damage. The only potential downside of this lock is that it has a backup mechanical key, as do most fingerprint door locks. The Yale YDM4109 is a mortise lockset that can be used in either commercial or residential spaces. One touch verification method paired with progressive scanning reduces the chance of the fingerprint sensor being exploited. It also makes interaction with the lock more efficient. The presence of an automatic alarm is a feature that small businesses and homeowners can take advantage of. There is also an emergency supply terminal that makes the lock accessible in the event of a power loss. This simple feature allows you to maintain your security even after facing a power outage. The 175 BIO fingerprint door lock claims to eliminate the risk of replication and unauthorized use. This is something that every fingerprint door lock aspires to prevent, but very few of them have the features to actually do so. Marks USA attempts to solve this problem with their 175 BIO fingerprint door lock that is paired with a Grade 2 cylindrical lever lockset. The cylindrical lever lockset is one of the common types of commercial door locks. If you know anything about the amount of force a lock can withstand, you will know that a Grade 2 lockset is not bad, but it is by no means as strong as a Grade 1 lock. However, in this case, the 175 BIO lock makes up for the lack of a Grade 1 lockset with the presence of additional security features. The fingerprint door lock has a fingerprint reader that can store up to 100 users at a time, and also has an audit trail of 4000 events. Essentially, this means that commercial properties will be able to monitor the way in which their space is accessed on a daily basis. This enhances documentation of events and decreases the chance of unauthorized access going unnoticed. Also, the fingerprint reader is made to read 80 points on your finger, which makes it less likely that someone could bypass the reader itself. There are some concerns to be had with the Grade 2 cylindrical lockset, but the lock is still very suitable for general commercial use. Of course, if you wish to increase the security of your office space, you can always take the time to install robust security measures that are built around your fingerprint door lock. Consulting with a commercial locksmith is one of the most efficient ways to accomplish this task. Optical Sensor that enables 80 point fingerprint capture for maximum security benefits. Capable of storing 100 user codes and providing an audit trail of 4000 events. Weather resistant lock body, which makes it great for outdoor use. The name Westinghouse does not carry the clout that it did in years past. You can chock that up to any number of reasons, but you will find that most of those reasons revolve around customer service issues. However, it is necessary for you to understand that not all Westinghouse products are made the same, so if you are holding a grudge against Westinghouse for their TV’s, you might as well let it go and pay close attention to the Westinghouse RTS Fingerprint Door Lock. The RTS fingerprint door lock is primarily geared towards security-sensitive business environments that would like to have better control over their commercial security and access control. It comes with an optical finger sensor that works in conjunction with a pin code and a mechanical key. This lock can be equipped to run with additional software that gives commercial properties a wider of array of actions their lock can execute. The fingerprint door lock utilizes a CMOS optical fingerprint sensor. A CMOS sensor is a nifty technology that is used to convert light into an electrical signal. This sensor is used to read the fingerprint in a timely fashion and then it verifies this against the collected list of fingerprint templates. High commercial grade lock body that allows the lock to surpass more than 2 million duty cycles. This means that your lock will last longer regardless of the number of people using it, and it will be that much harder for people to gain unauthorized access through forceful means. The lock has integration capabilities that are similar to smart home devices, which helps extend the way it can be used. This lock also allows you to transfer audit trails and view them on a separate device. Essentially, this means that there is no limit to the number of events you can track and account for at any given time. Most of the locks discussed above had one flaw as a commonality, and that flaw was the presence of a keyway. Locks that have a key way present did so for the purpose of having an alternate means of access or as override protocol, which is a common feature in security safes. As we have pointed out in several different articles, all locks can be picked, especially if there is a keyway present. This mode of access makes the lock more susceptible to lock picking as well as lock bumping. The ZKAccess TF1700 stands apart from all these other locks, and it does so by prioritizing security above all else. Do not think that this means the other locks are not secure, far from it. However, many of the fingerprint door locks that you can find on the market are trying to position themselves as hybrid products. Take the Ultraloq UL3 for example. 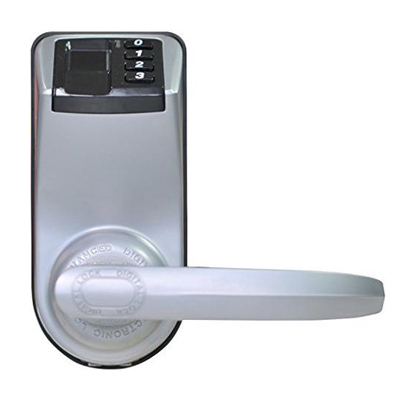 It is a fingerprint door lock that is attempting to fulfill the needs of both commercial properties and residential properties. In scenarios like this, it is most often the case that a key feature will be sacrificed along the way. The ZKAccess TF1700 sacrifices very little because it has a specific audience that intends to reach. This audience comprises of commercial property owners and business owners who are looking for better access control solutions. Also, this lock is particularly well suited for exterior use and interior use. The TF1700 is IP65 rated for waterproof and weatherproof structures. An IP65 rating is an ingress protection marking that estimates how durable a product is against intrusion and some elements of nature etc. The ZKAccess lock boasts a impressive 1.5 second user recognition rate, which will make operations much more efficient and improve ease of access for its users. This lock stores 3,000 fingerprint templates and is able to record up to 50,000 transactions. This feature enhances security by providing a more dependable way to keep track of the who accesses the lock and when they access it. With an IP65 rating, the TF1700 can withstand many harsh exterior elements. Not many fingerprint door locks are able to stand strong against elements of nature, but the ZKAccess fingerprint door lock does. As far as a fingerprint door lock goes, the Samsung SHS-P718 (SHS for short) is one of the best solutions that have cropped up on the market. Before I allow you to get ahead of yourself, you should not expect this fingerprint door lock to be flawless. You should expect it to have several features that make it easier to use, while simultaneously enhancing the state of your commercial security. It can also be used on residential properties, but its price point might exclude some homeowners from doing so. This fingerprint door lock utilizes a push-pull door handle that is meant to make the process of opening your door more efficient. Users are able to gain access to the lock by using fingerprints, RFID cards or a pin code. The primary access method is the fingerprint, but this fingerprint door lock has a double authentication mode, which gives you the opportunity to pair your fingerprint with another access method, thus strengthening your commercial security. Also, the SHS has the ability to store 30 pin codes and 100 fingerprints, which makes it an ideal solution for small businesses that want to explore different access control solutions. Unlike some of its other counterparts, the SHS does not rely on mechanical keys as a default access method. Instead, there are 5 mechanical keys included with each lock that can be used as an emergency override, if the fingerprint door lock battery dies, or if there is some other power related issue that impairs its regular function. The lock utilizes dual authentication mode which works to keep your home and office much safer. This is done by requesting a fingerprint and a password before the lock can be used. 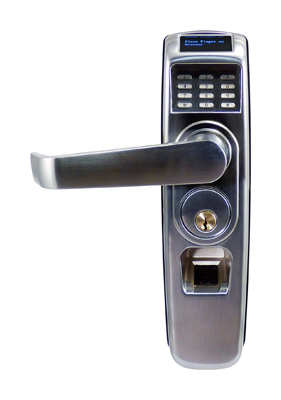 The SHS-P718 uses a mortise cylinder that is housed inside a robust lock body. The patented push-pull lock handle allows the lock to consolidate the handle and the main body into one mechanism, which makes it harder to bypass. There is a built-in alarm that can be integrated with other smart devices to cast a wider net of security across your home and office. This means that the alarm within the door lock can be triggered if someone attempts to break into your office or home through a window. Fingerprint door locks are exciting and efficient, and as people, we are drawn to products of this nature. Keep in mind that installing a fingerprint door lock does not mean that all your security woes can be thrown out the window. There are many changes you will have to make to accommodate your fingerprint door locks, and neglecting to do these things can really impair your security. Take the time to understand which fingerprint door lock will work best for your home or office, and then see if the security features that it has are enough to keep your property secure.